New Life in Spain: NaNoWriMo 2012 - The End. November has been this years novel writing month for me. It's interesting how intense a challenge like this can get. 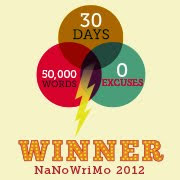 Writing 50 000 words in 30 days. And I don't take a challenge lightly, so when I make my mind up I will go for it! 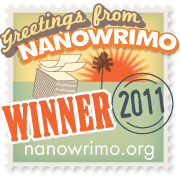 At last years NaNoWriMo. I started a bit late, had absolutely no plans or outlines. It all just happened along the way, and I had a blast! It was fun, sometimes scary and stressful not knowing what was going to happen, and I feared the "writers block" but it never came. This year, I though I'd try to plan a little. I made an outline, planned the main events and characters of my novel, and on November 1 I started writing. First of all, I can say that I think I actually had more fun writing the unplanned one. Maybe it was the not knowing that made it more exhilarating? This time, I kept wanting to come to a certain point in my story that I had planned would happen, but it was a bit boring at times, writing all the stuff leading up to it. But then again, the planning has made it easier to stay on track. I haven't spent that much time pondering and wondering about what was going to happen, so I have spent more time actually writing. This gave me an advantage and I have been ahead on my word count every day this whole month, and most days written more than the average 1667 words a day. On November 24 I reached the golden magic 50 000 word count! But I didn't slow down because of that. I was not settling for 50 000, as my novel isn't finished with that. 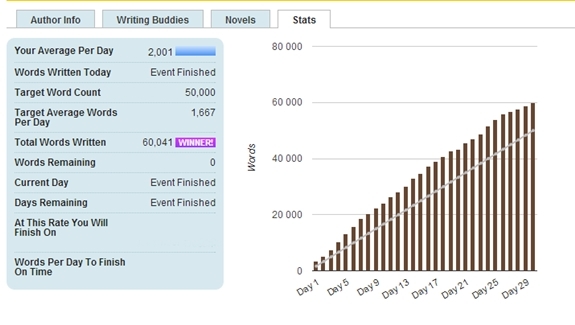 I had made a commitment to write every single day of November, so my new goal became to reach 60 000 words by Norvember 30. And I did! It has been stressful at times, annoying and a chore at others, but at the same time exhilarating and so much fun. Sometimes a friend would ask me..."But what's the point? What do you win?" Well- to me it is a personal challenge, to see that I could create this. Last year when I first heard about it, it seemed impossible to write that much during one month. And this year I have written even more! The feeling of surpassing my thought limitations is great. And just another proof that there really are no limitations. It's all about believing you are able to do something you decide you want to do! I love the power of the human mind! Since you are so good at writing pages and pages of stuff, care to write my research papers? I mean, you are on a roll already! Haha, send it over, no problemo! Jeg gleder meg til å kjøpe bøker skrevet av deg <3 Klem. Tusen takk søte! Det hadde vært veldig gøy om det en vakker dag kommer bøker til salg med mitt navn på! Enhorabuena! :) .. I knew you can make it. Gratulerer så mye! Jeg vil veldig gjerne lese!! Tusen takk for det! Tror det blir en runde eller tre med edits før disse ordene når andre øyne enn mine egne :P Men jeg er da godt på vei med et manus!